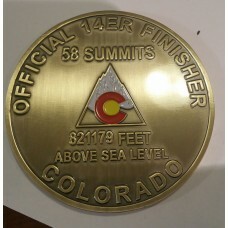 Plus several other US and International Mountains. 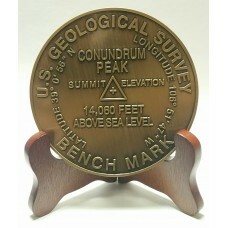 Our summit markers are an antique bronze color, stamped/molded especially for High Mountains, and are artistic representations of the classic U.S. Geological Survey Markers. 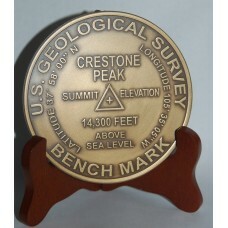 The markers are 3 ½ inches in diameter and 5.2 ounces in weight . 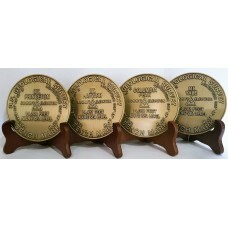 Each contains the latest and most accurate information available for latitude, longitude and elevation based on the latest NAD83 (1992) and NAVD88 standards. (See Product Data) Each marker comes with a walnut easel for a handsome display anywhere as well as a velvet style bag to store in. Each design may differ in color and edging as you would find on each mountain due to weathering and exposure. We use an antiquing method to produce this effect and may cause lines similar to oxidation that would happen to the metal outdoors. 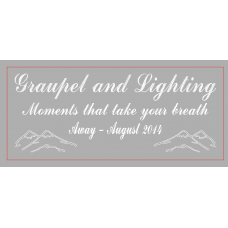 This can be different on each design and marker, making each on a unique and individual piece. 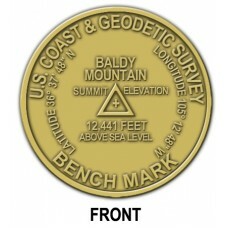 FOR THE TRUE SUMMITEER AT 58 Now you can celebrate the great accomplishme..
BALDY MOUNTAIN AKA Baldy Peak, Mount Baldy, or Old B..
Blanca Peak Summit Markers to commemorate your hike! Blanca Peak i.. THE CAPITAL PEAK Capital Peak Summit Markers to commemorate your hike! &nbs..
CASTLE PEAK Castle peak summit markers to commemorate your h..
FOR THE INCREDIBLE SUMMITEER AT 100 Now you can celebrate the amazing acc.. 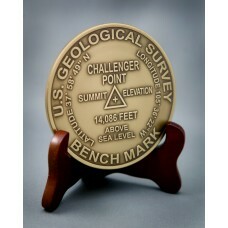 Challenger Point Summit Markers to commemorate your hike!. Challenger Poi.. Celebrate 4 Ivy League Summits! These 4 peaks, Named after Ivy League Universities..
Columbia Peak rises out of the Arkansas Valley and is located in Colorado's Sawatch Range. &nb..
Conundrum Peak Located near Aspen, CO, Conundrum Peaks summit is 14,060 feet, but, ..
CRESTONE NEEDLE Crestone Needle one of five peaks in the Sangre de Cristo range a..
Crestone Peak is the seventh highest peak in Colorado. It is the second ..
Culebra Peak Culebra Peak is the highest peak of the Culebra Range..
Get a custom engraved one of a kind marker for any peak or any occasion. Engagme.. CUSTOM ENGRAVING ON THE BACK SIDE OF SUMMIT MARKERS Custom Engrave any ..
Death Valley (Badwater Basin) is the lowest point in the lower 48, Death Valley is less than 1.. Celebrate a 4 bagger on this trip! 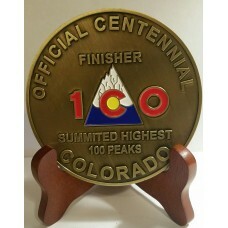 This is one of the few places you can go and s..
El Diente Peak is located in Colorado's San Juan Range. El Diente ('the tooth' in Spanish) is ..
Ellingwood Point Summit Markers to commemorate your hike! Ellingwood Point, or Ellingwood Peak, is a..
Grays Peak Summit Markers to commemorate your hike! 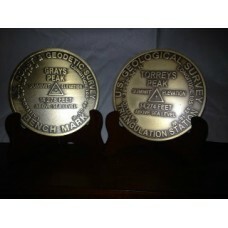 Grays Peak is the highest mou..
GRAYS AND TORREYS SUMMIT COMBO Get a discount..
Handies Peak Summit Markers to commemorate your hike! 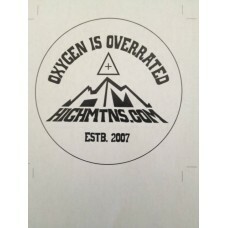 The view from Handi..
Show Off your need to get to the summit with our Window Decals. Great for car windows, Water Bottles..
Humboldt Peak Summit Markers to commemorate your hike! 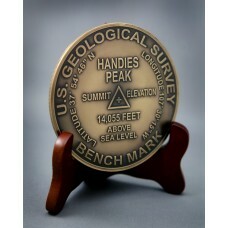 Humboldt Peak is a high p.. 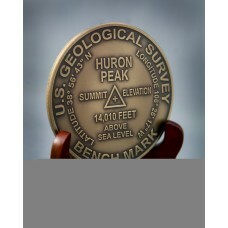 Located in Colorado's Sawatch Range, Huron Peak is a relatively simple climb with great views! .. Kit Carson Peak Summmit Markers to commemorate your hike! 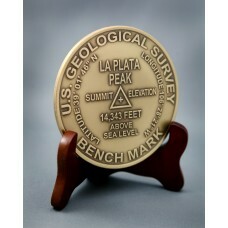 Kit Carson Peak is 14,1..
La Plata Peak Summit Marker to commemorate your hike! La Plata Peak is 14,336 fe..
Little Bear Peak Summit Marker to commemorate your hike! Little Bear Peak, or si.. 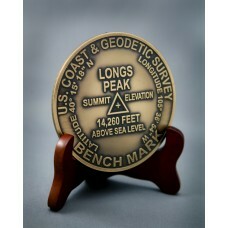 Longs Peak summit Markers to commemorate your hike! Longs Peak is one of the 58 ..
Maroon Peak Summit Markers to commemorate your hike! The Maroon Bells are two pe..